Article from Jakarta Globe. Note the eminently practical detail that, to promote local craftsmanship, as of this year all Kudus government employees are required to wear batik on Wednesdays and Fridays. With my consciousness now raised, I'll look out for Kudus artisans at future exhibitions. Pieces of batik hang in glass cases in the Batik Gallery at the Jakarta Textile Museum like illustrated pages jumping off history books. Each piece tells the life stories and legends of a bygone era in Kudus, the smallest district in Central Java. One piece shows a black-and-white motif of a capsized ship. 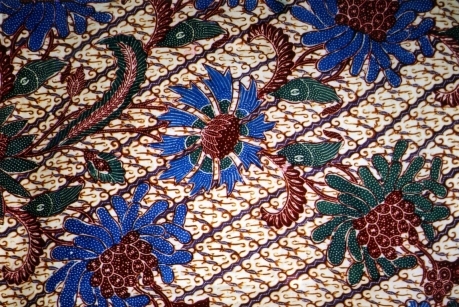 The unique piece of batik tells the history of Adm. Cheng Ho, who came to Indonesia in the early 1400s. One of his ships capsized just off the coast from Mount Muria, a dormant volcano, washing its cargo and survivors ashore. The ship’s cargo consisted of exotic spices from around the world that sprouted on the fertile land around the volcano and still grow there today. Its survivors, the admiral’s army, populated the villages below Mount Muria and are the ancestors of the people of Kudus. Another unique motif from Kudus is Pakis Haji , or Queen Sago Palm, which depicts the palm’s deeply furrowed trunks and lush green foliage. Yuli was one of the pioneers who led a batik revival in Kudus in 2005. 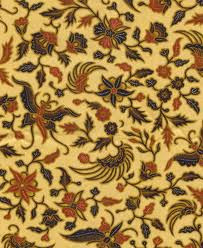 Since the early 1900s, batik from Kudus has been famous for its pictorial and calligraphic motifs. 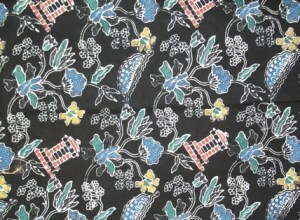 It reached its golden era in the 1930s, when Lie Boen Ien and Liem Wie Tjioe, batik artisans of Chinese descent from the northern coastal city of Pekalongan, also in Central Java, relocated to Kudus and set up production centers. 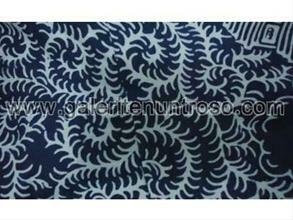 They combined their expertise and knowledge with the local cultural elements of Kudus batik. The Chinese batik artisans developed vibrant flora and fauna motifs in Kudus, such as the ornate buketan , or floral bouquet, and the exquisite merak katelia peacock and Cattleya orchids, designs that can take more than one year to create. 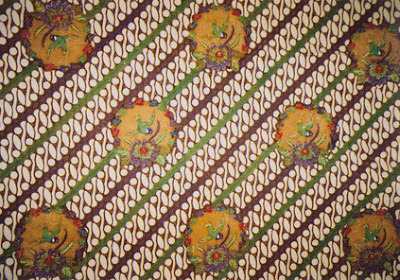 Handmade Kudus batik went into decline with the introduction of printed and hand-stamped techniques in the 1970s. Customers preferred these new varieties because it was much cheaper, due to the shortened production process. Kudus produces tobacco and cloves and is an important center for cigarette production, with more than 100 factories. By 2005, there was only one batik artisan left in Kudus, Niamah, who was then 75 years old and did not have any children to follow in her footsteps. The Kudus district government became concerned and invited embroiderers to Kudus to study batik under Niamah. However, only about 20 people accepted the offer and attended the free workshop. Even fewer followed through with what they learned at the workshop and seriously pursued the craft. 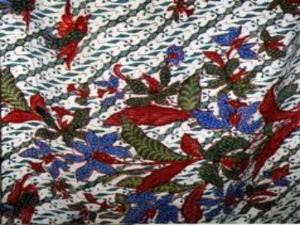 At the end of 2005, Yuli closed down her embroidery shop and opened Muria Batik Kudus, a workshop and production center. To promote her craft, Yuli participated in textile exhibitions in Jakarta. It was during one of these exhibitions at the Jakarta Convention Center in December 2008 that she met Miranti Serad and Ade Krisnaraga Syarfuan, members of a textile group called Rumah Pesona Kain. RPK was set up in 2005 as an organization for lovers of traditional Indonesian textiles. The group aims to revitalize Indonesia’s traditional textile industry by training and motivating traditional artisans, reintroducing traditional textiles to the Indonesian market and promoting traditional Indonesian textiles abroad. “Kudus batik is not only a work of art, but also a cultural product with a deep historical and philosophical meaning,” said Ade, one of the group’s leaders. “Take the yellow-and-black motif that resembles undulating valleys. It was adapted from the Arabic inscription of ‘Allah.’ The batik reflects the deeply ingrained religious nature of the people of Kudus,” she added. Ade and Miranti proposed including Kudus batik as part of RPK’s incubation program, which aims to revitalize the production of traditional textiles by training, motivating and funding traditional artisans. Currently, RPK’s program is active in 19 areas the country. So the two began the job of helping to revive Kudus batik. At the time, the art form had lost much of its originality, so the pair conducted in-depth research and borrowed old pieces from collectors for local artisans to reproduce. One of the collectors was Hartono Soemarsono, a batik entrepreneur who owns more than 600 vintage pieces from all over Indonesia. Fourteen of Hartono’s pieces of Kudus batik from the 1930s and the 1940s are now on display at the Jakarta Textile Museum until the end of the month. RPK promotes the final products of all that effort in various textile expos in Indonesia and abroad. The groups has also invited a number of high-profile Indonesian designers to create collections using the textile. Fashion designer Barli Asmara is one of them. The designer presented his collection “Pesona Batik Kudus” at Graha Bimasena in South Jakarta at the end of March. Barli combined Kudus batik with intricate tobacco motifs, lace and brocade and made them into stylish dresses and flared skirts. He also combined the batik with vibrant butterfly motifs, chiffon and taffeta to create elegant jackets. “I wanted the young generation to realize that Kudus batik can also look young and trendy for their daily wear,” Barli said. The designer’s work is on display at the RPK gallery in Epicentrum Walk in South Jakarta. With so many exhibitions and fashion shows, Kudus batik has enjoyed a newfound popularity. In April, Djarum, one of the country’s largest cigarette producers, which is based in Kudus, ordered 70,000 pieces of batik from Yuli for employee uniforms. “It’s a special batik that incorporates traditional Kudus motifs, including tobacco leaves, cloves and shipwrecks,” Yuli said. This year, the Kudus district government passed a regulation that requires all civil servants to wear local batik every Wednesday and Friday. “Hopefully, this regulation will help to support the growth of the local batik industry,” Yuli said. With growing demand, the industry has once again expanded and attracted young artisans. Today, Yuli employs 40 paid artisans at her workshop. In her spare time, she organizes free batik workshops for students from elementary school to high school. Talented participants from the workshops could get the chance to be hired as artisans for Yuli’s workshop. One of the newest hires is 21-year-old Malihatun. After graduating from high school in 2009, she took part in a workshop to learn how to paint batik. After she completed a three-month training course, she was asked to join the workshop full time. Malihatun jumped at the opportunity. Some of her friends chose to work in the cigarette factories in Kudus, but Malihatun never looked back. A high point for Malihatun came when she watched her favorite actor, Reza Rahadian, win the Best Actor Award at the Indonesian Film Festival in December last year. On the television screen, the actor accepted his award in a black batik shirt, featuring a Queen Sago Palm motif that gave away its Kudus origin.